Oregon Trail. I mean, let’s be real here–who didn’t think of Oregon Trail lickety-split? Who among us can forget (am I dating myself?) that wonderfully pixelated covered wagon trundling along a two-dimensional river; your passengers dying of dysentery because you decided the “Rest for a while” option was for chumps; and the tiny box telling you that, congratulations, you shot 102938475 lbs of meat and probably sped up the extinction of wild buffalo species tenfold and oh yeah, you were able to carry back 2 lbs of it. Go you! Quarters: Remember when they started minting those nifty quarters customized to each state? This one is Oregon’s and holy freakin’ bananas I think I just had an epiphany when I Google searched that. Up until this moment, I never realized Crater Lake was on Oregon’s quarter. Do you all know what Crater Lake is? It’s this massively isolated lake in the middle of a c rater when a volcano blew up and collapsed in on itself thousands of years ago. There’s no flow of water in and out of the lake except from all the melted snow on the slopes of the crater, which means the water is some of the purest in the world and a fiery sapphire blue. It’s gorgeous. I just got back from my first-ever visit to the lake and I’m still over the moon about it (as you can probably tell). We stayed at the Crater Lake Lodge, which is the only lodge accommodation in the area if you don’t want to drive two hours in and two hours out on the same day. We got up for the sunrises, which gilded the lake and set the whole horizon on fire. Oh and my owl arrived–I found Hogwarts. 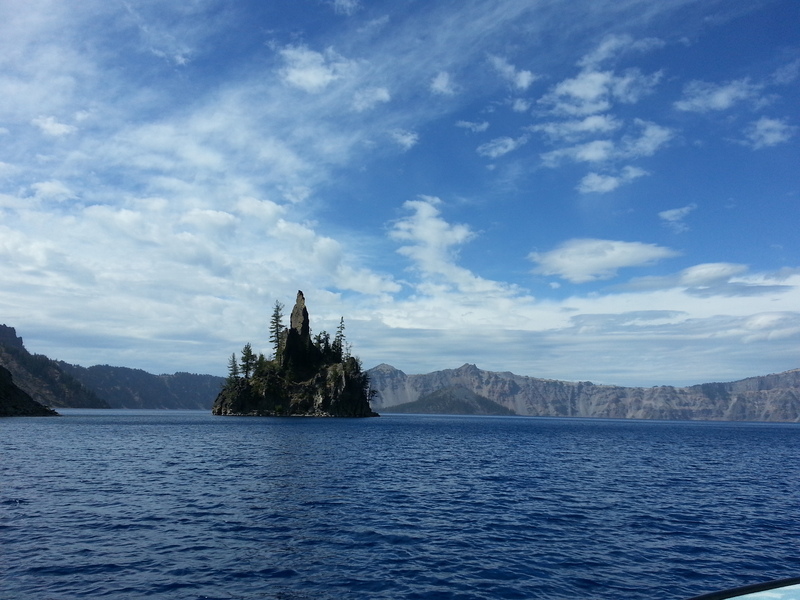 That’s actually the Phantom Ship island in the middle of the lake, which we reached after hiking down a mile’s steep slope of the crater edge–but a witch can dream, right? Anyway, if I don’t get too ADHD and stuff, I’ll definitely tell you more about the trip in my upcoming posts! 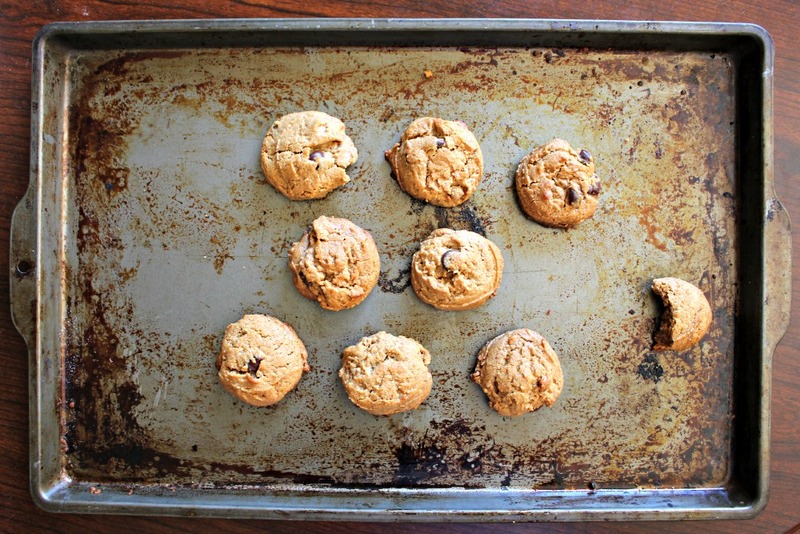 These are DREAM cookies: gluten-free, 5 ingredients, and a whopping 20 minutes from start to finish. Plus, they were so good that everyone who tried them clamored for them to be sold. 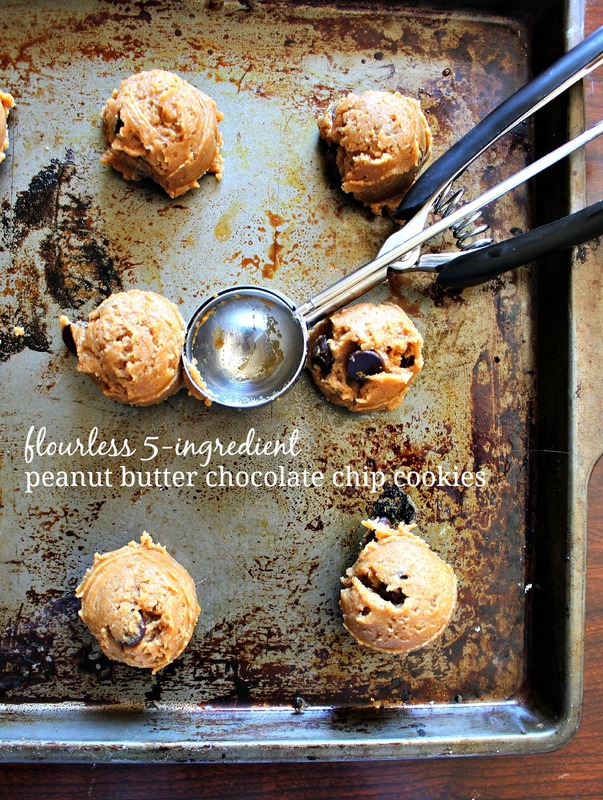 I think they might even rival my other favorite peanut butter chocolate chip cookie recipe, which is saying a LOT because they have been selling like wildfire in bake sales AND they are the most popular recipe to date on Wallflour Girl. Score! Probably my favorite part about these cookies, though, is that they’re for a great cause. 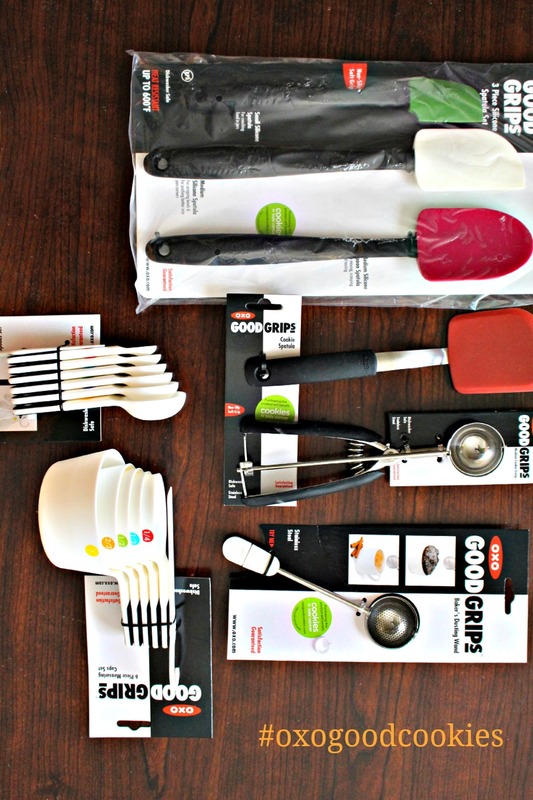 When OXO offered to send a set of cookie cookware to benefit Cookies for Kids Cancer, I knew I needed in. The campaign was started by two OXO folks who were inspired by their two-year old son’s battle with cancer to make–and bake–a difference. I knew I was supporting a great cause, but when my package arrived in the mail, I was floored by the quality of the tools I received–and trust me, I’m not just saying that. I don’t own many top-quality baking tools because the dollar store is secretly my BFF, but I received the drop cookie set and would buy it again in a heartbeat. This is the first time I didn’t have to struggle with sloppy, lopsided balls of dough that stick to the spoon–and believe me, this dough is a sticky one! My favorite new tool on the lower right: a medium cookie scoop! Want to bake a difference? Great news! You can find a list of these marked products here. Having trouble finding a store that stocks these awesome #oxogoodcookies products? No problem! Use this store locator to find the shop nearest to you. Once you’ve grabbed your stickered OXO cookie-making tools, feel free to sit back, relax, and feel good about yourself while enjoying a tall glass of milk with these awesome cookies. Maybe give yourself a high five, too. Goodness knows you deserve it. Disclaimer: This is not a sponsored post. 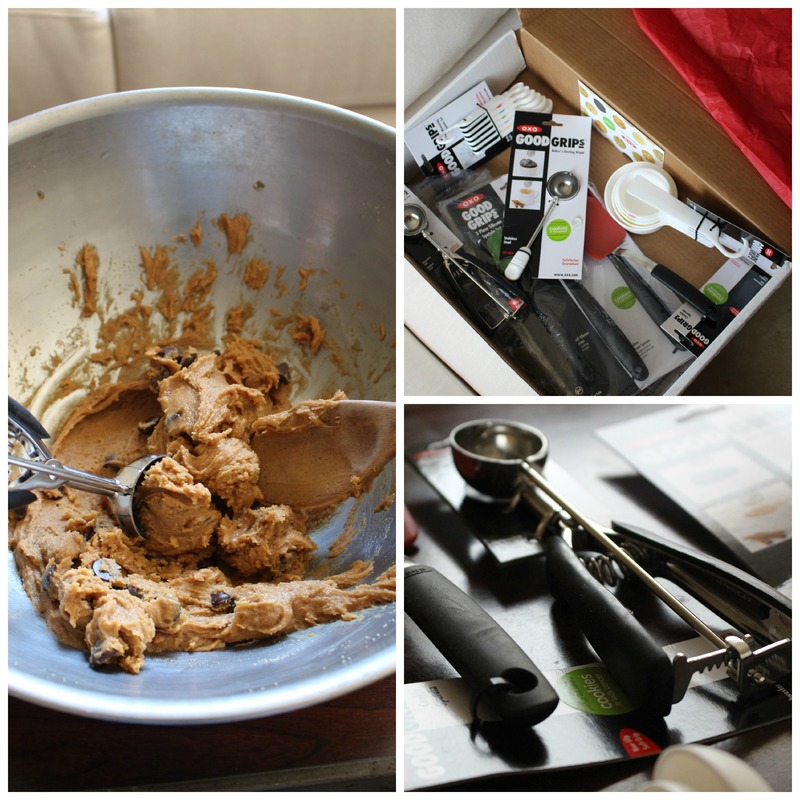 I received no paid compensation and was selected to be part of OXO’s Blogger Outreach program, for which I received a drop cookie box set to use in the making of these cookies. All opinions in this post are mine–because yes, I do think this is a darn tootin’ good cause! 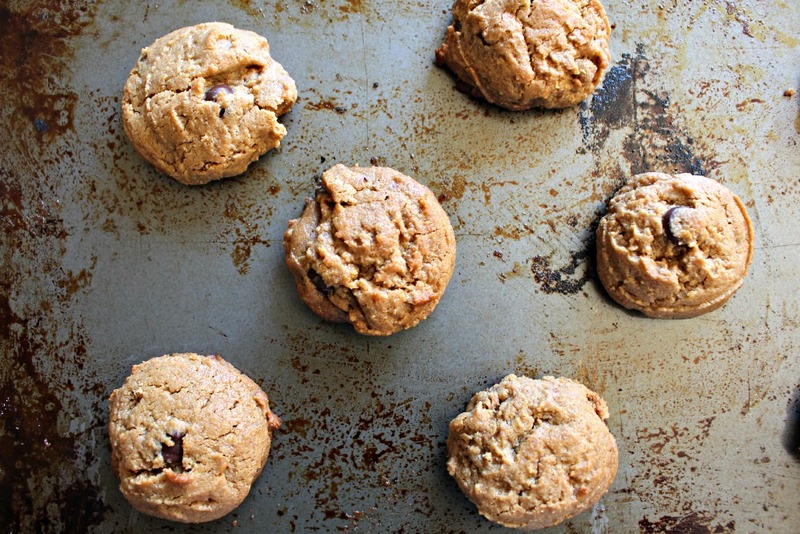 One of the most epic and requested peanut butter cookies of all time--without the flour! These cookies take only 20 minutes from start to finish, and make the perfect time-saving dessert. 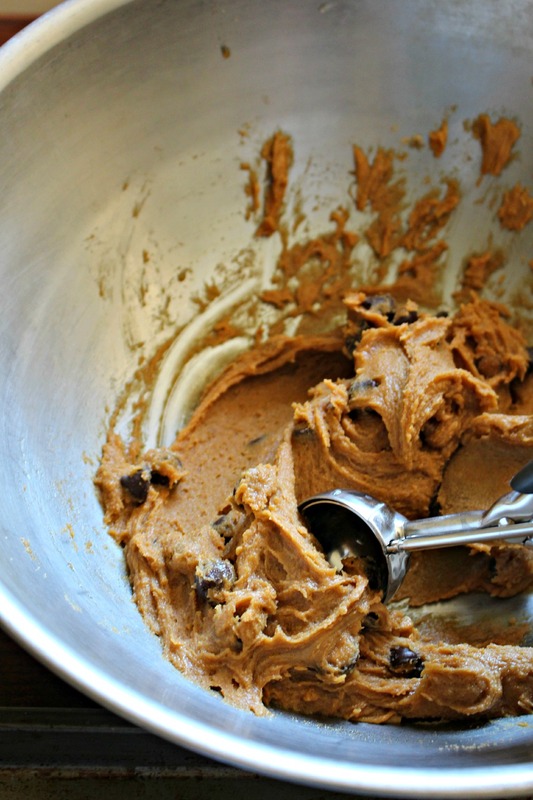 In a large mixing bowl, cream together peanut butter and brown sugar. Beat in egg and vanilla. Add baking soda, then fold in chocolate chips. 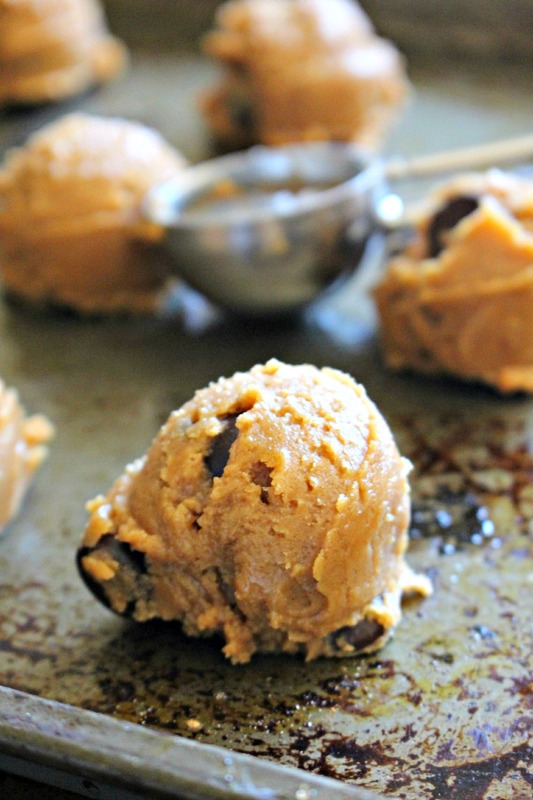 Scoop out dough by tablespoonfuls (I used the OXO cookie scoop pictured above) and drop onto prepared cookie sheet. Bake in preheated oven for 8-10 minutes, until edges have set and turned a light golden color. Ala, this recipe looks perfect! Definitely will be a new staple in my kitchen for sure. Ohh it most definitely is, Nora! you’ll LOVE it. Thanks so much–I hope your prep is going amazingly!! Ooo, these sound really truly delicious. And flourless – so nice! Joyti, it’s so great to meet you! I’m so glad you like them–you’ll love ’em even more once you taste them. Wonderful to connect with you, I just checked out your blog and it looks MARVELOUS. Bookmarked for future chatting–cheers! Dying here for a cookie! Hehe, mission accomplished, then. Just kidding! I’m not amazing by any stretch of the imagination, but I looove what I do. And I know you do, too! You rock, Uru–have yourself an awesome weekend, girl! Ooh, I love pb cookies! These look Why have I never added chocolate chips???? And I love Crater Lake…we stopped by when I was in high school and the beauty just takes your breath away.. And Oregon Trail came to mind first for me…but it was my oldest that played. I think it was one of his first computer games! Omg Liz, you need these choco chips they are the BEST! I seriously cannot go back to my normal peanut butter cookies anymore without them. Hah! I love your Oregon Trail experience–hey, we’ve all got to start somewhere. Have yourself a lovely weekend and start to the week, Liz! Six years ago, my colleagues and I were competing for the Oregon Cup (a crappy trophy picked up at some yard sale) by seeing who could score the highest on the Oregon Trail. I failed miserably (all my damn players kept dying) but it was a heckuva lotta fun. Wow, Crater Lake is gorgeous! I’m glad you had a fabulous trip and were able to unwind. I’ve never made a flourless PB cookie but I’m always in awe of them (and have collected like, a bazilliion different recipes). Yours look perfect, as if they were made with flour! Love the photos and GIFs as always, my friend. The Oregon Cup?! That sounds like an awesome throwback idea, I can’t wait to try it–though it’s not our fault if they die from dysentery all the time, geesh! They need to learn to stop being so delicate, IMO. 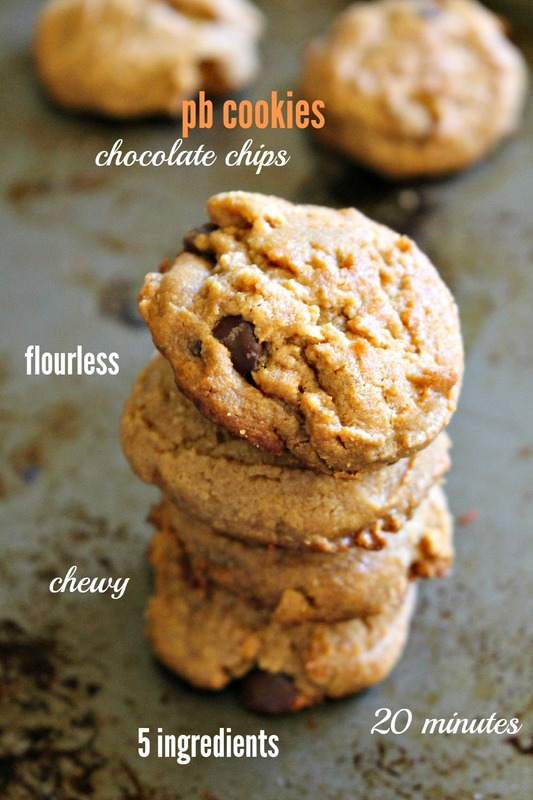 I hope you do get to try flourless PB cookies, they take like a split second to throw together and are therefore x1000 better than any other cookie, ever. <3 love ya, Nancy! Also! How did you make your navigation bar under your title? I am new a blogger and i am trying to improve how it looks! If you could help, that would be great ! Wow, thanks a bunch, Takara! I hope you did get a chance to make them–and that you loved them as much as I did! As for the navigation bar: great question. To be honest, it’s not a “true logo” right now–meaning it’s text rather than an image logo. Depending on what layout you’re using, you might have a function that allows text headers to appear above the nav bar–what layout are you currently applying? If you want to get into the real header-above-nav-bar stuff, you’ll need to start digging through your header.php files. I don’t currently have access to mine, so unfortunately I can’t show you–but I hope that helps some! Cookies look so cute! 😀 Love the very first photo! Aw, aren’t you a sweetheart! Can this recipe b doubled? Anxious to try…thank you! !